I have eaten variations of this dish for many years. 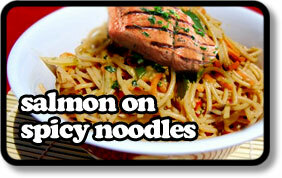 I love the spiciness of the noodles alongside the flavour of salmon. The two work perfectly together. It’s a pretty simple and quick dish to prepare and you can use whatever vegetables you like in the noodles. Preheat the oven to 140ºC. Season the salmon with salt & pepper. Cover the noodles in boiling water and set aside for 5 minutes, then drain. Heat a frying pan over medium/high heat and add 3-4 tablespoons of oil. When hot, add the salmon, skin side down and fry for 2-4 minutes until the fish looks cooked half way up the side. Turn and fry for 1 minute. Remove from heat and put the whole pan in the oven. Cook for 5 minutes. Meanwhile, heat a wok over a medium temperature add 2 tablespoons of oil and when just hot, add the beaten egg. Let it fry like an omelette then cut it up with the back of your spoon. Remove and set aside. Add another tablespoon of oil and add the mushrooms and beans. Stir fry for 1-2 minutes then add the curry paste, stir briefly and add the prawns, noodles, soy sauce, fish sauce, lime leaves and cooked egg. Stir continuously for 2 minutes. Remove from the heat. Stir in half the fresh coriander just before serving. Serve the salmon on a bed of noodles sprinkled with the peanuts and remaining coriander. You can also add a lime wedge for squeezing if you feel like it. If you want to make your own paste then use this recipe. Just whizz everything together in a blender or food processor. It will make more than you need, but the other uses of paste are limitless, so freeze what’s left. I have also used shop bought pastes for this dish and they’re perfectly acceptable.